Pepe Escobar is an independent geopolitical analyst. He writes for RT, Sputnik and TomDispatch, and is a frequent contributor to websites and radio and TV shows ranging from the US to East Asia. He is the former roving correspondent for Asia Times Online. 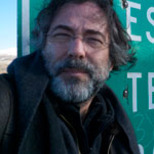 Born in Brazil, he's been a foreign correspondent since 1985, and has lived in London, Paris, Milan, Los Angeles, Washington, Bangkok and Hong Kong. Even before 9/11 he specialized in covering the arc from the Middle East to Central and East Asia, with an emphasis on Big Power geopolitics and energy wars. He is the author of "Globalistan" (2007), "Red Zone Blues" (2007), "Obama does Globalistan" (2009) and "Empire of Chaos" (2014), all published by Nimble Books. His latest book is "2030", also by Nimble Books, out in December 2015. The new Ukraine of “Yats,” Tyahnybok and Yarosh, in a rush, signed the political points of an association agreement with the EU in a Brussels summit last Friday. No less than 30 (unelected) EU bureaucrats also signed it, including European Council President Herman Van Rompuy and European Commission (EC) President Jose Manuel Barroso. This is the same deal former president Viktor Yanukovich decided to scotch last November – which subsequently led to the Maidan protests, a US-supported putsch crammed with fascist and neo-nazi actors, and Moscow taking over Crimea without firing a shot. Hold your (Mongol) horses; as the record shows, “democracy” and “the rule of law” are not exactly features of the Svoboda and Right Sector regime-changers in Kiev. Yanukovich scotched the EU deal for two essential reasons: it would destroy Ukrainian industry (opening the door to an invasion of Western products and the takeover of rich agricultural lands by Western agro-business); and it would force Ukraine to obey NATO military protocols. What was signed last Friday is not even the meat of the matter; that’s trade integration – shorthand for “How Ukraine will be Plundered.” The EU left it for later – first the IMF must polish the ultra-stringent details of the upcoming “structural adjustment.” The European Council, for its part, is promising a rose garden. Article 7.2. of the association agreement states that Ukraine will have to comply with the common foreign and security policy (CFSP) and the European security and defense policy (ESDP). The conditions are spelled out here and here. The obscure – even for most Europeans - ESDP happens to be the key European pillar of NATO. Translation: it details how the EU is subordinated to the US (which controls NATO). For instance, the EU may only act in a determined case if NATO first declines to. Additionally, the March 2003 Berlin-plus agreement allows the EU to use NATO’s hardware and software for military operations if NATO declines to. What this essentially means is that Ukraine is on the road to become legally bound to NATO’s overall project. Along with other independent analysts, I’ve argued from the start that this whole geopolitical drama is first and foremost about NATO annexing Ukraine. The NATO-Ukraine twisted love affair started in the early 2000s. After some soul-searching, it was decided NATO or no NATO should be the subject of a national referendum in the future. In the 2008 Bucharest summit NATO opened its arms, stating that Ukraine could join as soon as it met the criteria. In 2010 Yanukovich announced Ukraine was not interested anymore. Still, Ukraine remains quite a muscular member of NATO’s innocent-sounding Partnership for Peace (PfP). He forgot to add: a Europe under free and peaceful submission to the Pentagon. NATO’s top military commander, who is - surprise! – an American, Gen. Philip Breedlove, is spinning that Russia amassed a “very, very sizable and very, very ready” military force on the eastern borders of Ukraine. Moscow denies it, and points out these troops comply with international agreements. Someone’s obviously got to give. Russian Defense Minister General Sergey Shoigu has been on the phone with Pentagon supremo, Chuck Hagel. They are talking “de-escalation of tensions.” Yet EU politicians and NATO functionaries seem to have not been briefed. The EU spin on Western corporate media is that relentlessly demonized President Putin wants to “destabilize” Ukraine and create a Russian sphere of influence in southern and eastern Ukraine as far as Odessa. Oh yes, and annex Transnistria. In fact, it was the speaker of Transnistria’s parliament, Mikahil Burla, who has asked Moscow to incorporate the Russian-speaking region in Western Moldova into the Russian Federation. After all, already in 2006, 97.2 percent of voters in a referendum said exactly the same thing. Moldova – just like Ukraine - will sign an association and free trade agreement with the EU, and Transnistria wants no part of it. It remains to be seen how the EU – essentially via the IMF – will “save” the monstrously bankrupt Ukrainian economy. 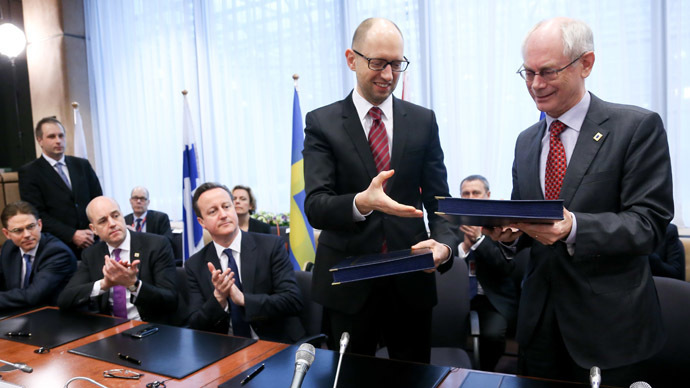 An association agreement will only make things even gloomier for average Ukrainians. Whatever trickle of cash flows to Kiev, it will come with humongous “austerity” clauses attached. Moscow does not have to “annex” or “invade” anything; it just needs to sit back, relax and watch the West manage its self-created mess. Apart from fiery NATO rhetoric and that only slightly relevant signing in Brussels last Friday, there are few indications so far the “lost in its own pivots” US and a beleaguered EU have the ability, the willingness and the necessary commitment to support the Kiev regime changers all the way. And all that 15 years after NATO’s bombing of the former Yugoslavia - which led to serial regime changes, balkanization and a “grand prize”: Mafialand Kosovo, and its prime real estate asset, Camp Bondsteel, a key plank in the US Empire of Bases. Rasmussen wants NATO to go for a replay in Ukraine? But fools rush in where angels fear to tread and Russia is no Kosovo.